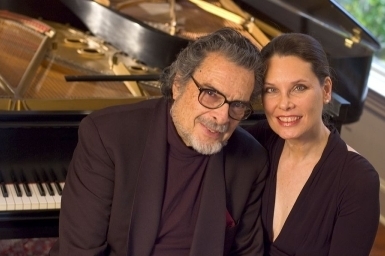 Leon Fleisher was a piano prodigy and star in the world of classical music who made his Carnegie Hall debut at the age of 16, and performed as a soloist and with orchestras in concert halls all over the world. Then, in 1964, his right hand curled and became immobile because of a neurological disorder called focal dystonia. A conductor and teacher at the Peabody School of Music here in Baltimore, he devoted himself to developing a left handed repertoire, conducting, and teaching piano. After 30 years of seeking various treatments to regain the use of his right hand, a combination of botox injections and rolfing finally allowed him to play with both hands. In 2004 he released his first recording in over 40 years with both of his hands – the aptly named Two Hands. For the past several years he and his wife, Katherine Jacobson Fleisher, also a critically acclaimed pianist, have been working on a repertoire of duets. They joined us in the studio to discuss their work together, and their upcoming benefit for the Baltimore Animal Rescue and Care Shelter this Friday, June 4th, which will be their only joint appearance in Baltimore this season. The benefit will be held at the Peabody Institute, and doors open for a silent auction at 6:30 with the concert beginning at 8pm. The phone number for more information is 410 – 396 – 4695, or find out more online at www.baltimoreanimalshelter.com.